Prices quoted are for 12 people contact for price for extra guests and discount for bookings over two week stays. With several private chill out areas, sun terraces, gardens and lawns, there are abundant possibilities for a snooze and quiet time in your own quiet corner, plus lots of outdoor space for all to enjoy being together at this property. It is set in 85,000 square metres of private pine-clad woodland, so there are even some fabulous walks to savour too! The views from the pool area are stunning - mountains, the San Miguel fortress village church perched on the hill, and the sea. Ideal for large families, groups of friends, corporate events, special occasions and important get-togethers, it is also wheelchair-friendly, with an automatically illuminated wheelchair path all around the house, pool and pool terraces, thus making it possible for everyone to get together outside and to the dining areas. 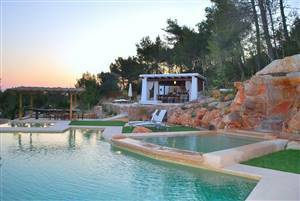 The pool terraces are all fully equipped for 12-18 people; this is a family or friends villa; gardens and pool areas are child-friendly, and it is also ideal for 5 couples or less! You can always find sun and shade somewhere around the property grounds, from 10.00 hrs until sundown! Also perfect for a wedding banquet - why not get married in the village church then have your celebratory meal in the gardens of the villa with the church in your photos from the villa gardens?! Only a 10 minute stroll (minutes drive) to the village of San Miguel with its sprinkling of laid-back bars, cafes and shops plus weekly artisan /craft market and regular displays of local folk dancing in Ibicencan costume in the church courtyard. A further 10 minute drive (or local bus) down to the Port of San Miguel and the beach plus its beach bars/restaurants and Na Xamena. A 10 minute drive ( or bus ride) will take you to the nearby picture-perfect village of Santa Gertrudis for some great tapas bars and craft shops. It's a favourite meeting point for all walks of life from all over the globe and well worth a visit by day or by night! 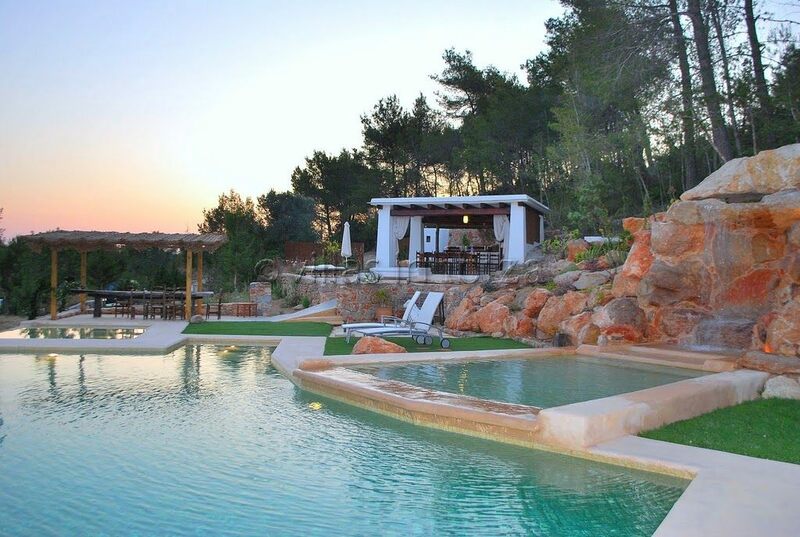 Ibiza Town, the capital of the island is only a 20 minute drive away! Split level well equipped kitchen with 5 ring BORETTI FRY-TOP cooker, double electric oven, dishwasher and all modern conveniences leading onto rear garden shaded area. 1 bedroom with 2 bunk beds, plus one bed which can be made giving 3 single beds, (ideal for children) with direct entrance to shared master bathroom This is is for the use of the whole house sleeping 15 people. 1 Master bedroom with king size bed (2m x 2m) plus one single, en-suite bathroom with double walk-through rain shower leading onto back courtyard,large sink and walk-in dressing room, front terrace with Love Seat. 1 Spacious Master King sized bedroom, facing floor to ceiling windows which open fully onto the gardens and valley, with views of the hilltop village fortress church and rolling hills. 1 Twin bedroom with two single beds. Hidden at the pool area is "the Blue Room" with 1 Double bedroom, very romantic, with fabulous outside natural shower and use of pool bathroom, wooden sundeck looking into the valley and the distant village fortress church. Price includes indoor cleaning two days per week, (extra can be arranged if required), bed linen, towels, pool towels, pool and garden maintenance twice per week. In summertime all beds have mosquito nets plus fan in the room, and in wintertime firewood, terrace heaters and duvets plus blankets are provided. The kitchen and TV Lounge have underfloor heating. Due to this being a very Old Finca with thick walls the villa has no need for Air-Con. 2,000eur security deposit paid on arrival to owner. Prices of this villa are for 10 adults + 2 child but the villa can also be rented with 8 bedrooms so sleep up to 16 people, please ask for prices!!! Check in is from 1600 hrs on the day of your arrival and checkout is at 1000 hrs on the day of departure.